Scientists at DESY have developed and implemented an optical synchronisation system for the soft X-ray free-electron laser FLASH, achieving facility-wide synchronisation with femtosecond precision. The performance of the system is expected to ultimately be at least ten times better than what has been achieved anywhere so far using electronic techniques. 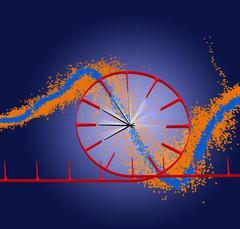 At this level of control, ultrafast experiments can be performed systematically with the highest temporal resolution, as the team led by Holger Schlarb and Sebastian Schulz from DESY’s machine control and linear accelerator research groups and Adrian Cavalieri from the Max Planck Institute for the Structure and Dynamics of Matter reports in the journal Nature Communications. Free-electron lasers (FELs) generate ultrashort and ultra-intense laser-like light pulses by sending fast electrons from a particle accelerator through a magnetic slalom course. In each bend, the particles emit tiny flashes of light that add up to a strong laser-like pulse. X-ray FELs can be used to reveal the dynamics of the microcosm, such as chemical reactions or properties of biomolecules. For these investigations, however, the timing of the pulses and all the components of the facility must be synchronised with the highest possible precision. In this key demonstration, the optical synchronisation system locked all independent accelerator subsystems and external experiment lasers with a precision of 28 femtoseconds – a mere fraction of the X-ray FEL pulse duration of 90 femtoseconds. A femtosecond (fs) is a quadrillionth of a second. So far, accelerator facilities and X-ray FELs have primarily been synchronised using electronic radio-frequency clock signals. The best synchronisation achieved in this way is limited to about 100 femtoseconds – a restriction that prevents the use of FELs at their full potential for certain applications and inhibits their future development. The optical synchronisation generally improves the characteristics of the X-ray FEL pulses, including arrival time stability, photon energy, intensity and pulse duration. From the experimentalists’ perspective, however, delivering X-ray pulses with stable properties at exactly the right time is only half of the challenge. The other half rests in the ability to simultaneously deliver an independent optical laser pulse, which is required to initiate ultrafast processes including chemical reactions in molecules and phase transitions in materials. The evolution of these complex dynamics can then be observed using the X-ray FEL pulse. To achieve the maximum time resolution in these studies, ideally, the optical laser pulse should be delivered with a timing precision that is a fraction of the X-ray FEL pulse duration. And the optical synchronisation system now demonstrated at FLASH does just that. Crucially, the team found that the quality of the optical synchronisation is limited primarily by the X-ray FEL pulse duration, meaning that the precision should be even better with shorter X-ray pulses. This level of control will not only allow ultrafast experiments with highest temporal resolution, but also open up new possibilities for FEL development. An optical synchronisation system based on this prototype will be implemented in Europe’s future X-ray laser European XFEL, currently under construction from the DESY campus to the neighbouring town of Schenefeld.